Is social enterprise becoming a reactionary force? It's highly unlikely that capitalism will be transformed from within (originally published May 13 2015 and republished as part of our tribute to Rick Cohen who died this week). 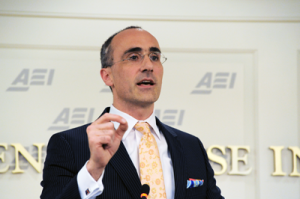 Arthur Brooks, President of the American Enterprise Institute. Credit: http://www.aei.org. All rights reserved. In 2013, social enterprise advocates found a new ally to burnish their credentials as economic and political progressives—America’s most famous right wing radio talk show host, Rush Limbaugh. "Now we're going to reward businesses that do not make a profit if someone approves of their social mission,” Rush bellowed, in reaction to the rise of so-called “L3Cs” or “Low Profit Limited Liability Corporations. “This is designed to pervert capitalism." About time too—if like me you’re one of the ‘perverts’ intent on transforming our disastrously unequal and unsustainable economic systems. That’s what ‘social enterprises’ like L3Cs are intended to accomplish, by replacing conventional businesses with radically different institutions. These institutions are designed to attack social and environmental problems though the market—not exactly ‘flavor of the month’ for Limbaugh and his allies. Only in the United States would a movement predicated on the ability of capitalist enterprise to solve social problems be viewed as a ‘socialist plot.’ But behind the hysteria there’s something more interesting going on: a struggle for the soul of social enterprise between progressives and conservatives. Despite developments on the air waves and in states like North Carolina, social enterprise has enjoyed a recent boom in support on the right of American politics. This movement is especially strong in conservative think tanks and among younger, millennial-focused Republican legislators like Illinois Representative Aaron Schock (who recently resigned from Congress amid charges of misspending public funds), and Indiana’s Todd Young—the cosponsor of Congressional legislation on ‘social impact bonds’ (another way of drawing business into the provision of public services in return for a profit if the venture is successful). There have always been tensions in the social enterprise community between ‘reformers’ and ‘transformers,’ with the balance between social and financial criteria shifting one way or the other. But what’s happening now is a more deliberate attempt to move the debate in a more conservative direction—which begs a crucial question: is social enterprise the harbinger of progressive change in the economy, or the soft edge of efforts to conserve the legitimacy of capitalism in its current form with a few marginal adjustments? The first issue in this debate concerns the ‘negative externalities’ that result from all economic activity, notably increased pollution and natural resource extraction that stem from rising consumption and production. In the conservative reading of social enterprise, the problem of capitalism isn’t its externalities, but the business focus on an attachment to ‘abundance.’ That’s the argument of Arthur Brooks, for example, the economist who leads the American Enterprise Institute, one of Washington’s leading conservative think tanks. According to Brooks, the world’s progress is due to globalized capitalism, but capitalism has gone a little off the rails by focusing on the accumulation of things, rather than on helping everyone to be—or at least feel—‘entrepreneurial.’ So encouraging more ‘social entrepreneurs’ is the answer to this problem. By being simultaneously more entrepreneurial and less attached to abundance, fewer negative externalities will be created. And that means there’s no need to transform the economic system through a more radical redesign. Secondly, whenever social enterprises grow to a scale where they can make substantial profits, they tend to be acquired by larger corporations—Ben & Jerry’s ice cream by Unilever (#113 on the 2015 Forbes Global 2000 of the world’s biggest public companies), the Body Shop by L’Oreal (#178), Tom’s of Maine by Colgate-Palmolive (#445), Odwalla juices by Coca-Cola (#93), Stonyfield Farms yogurt by Danone (#285), and Boca Burger by Kraft Foods (#410). As soon as new institutions grow to a scale at which they might influence the economy on a systemic level, they are snaffled up by more conventional firms which have no interest in deeper transformation. For conservatives however, the absorption of social enterprises by larger corporations isn’t a problem, it’s an advantage: these behemoths are seen as more attentive to social and environmental issues through their acquisitions without having to alter their core business. It is difficult to imagine which ‘table’ for problem-solving isn’t designed, built, and largely owned by the business sector, at least in America. The nation’s decision-makers are awash in corporate campaign contributions, and the nonprofit sector is frequently beholden to corporate philanthropy. But by emphasizing the social benefits of new forms of enterprise it’s easier to sell an even bigger role for business. Fourth, much of the enthusiasm for social enterprise downgrades the contributions of organized labor in ‘civilizing’ the economy. The people who brought you the concept of the weekend and much else besides—labor unions—don’t get much of a nod. In fact conservatives see unions as a hindrance to the success of social enterprise, and collective bargaining isn’t recognized as relevant for these new forms of institution. In the US, an organization called B-Lab certifies social enterprises as “B Corporations” in a process akin to Fair Trade certification for coffee. On labor issues, the B-Lab’s assessment criteria include job growth, health insurance, and other benefits, but the notion that employees might benefit from having a collective voice to argue for their interests is nowhere on the list. Despite the Case Foundation’s concern about business not being ‘at the table,’ the reality is that the rising power of corporations has mirrored the declining strength and influence of labor in the United States. The most recent information from the Bureau of Labor Statistics shows that union membership in U.S. private industry has fallen to 6.6 percent of the workforce, down from 7.9 percent a decade earlier. Membership is almost negligible in some states of the Southeast and Midwest where social conditions are at their worst, wages are lowest, and the social safety net has the biggest holes. By eschewing the need for collective bargaining, social enterprise feeds into the belief held by reactionary interests that unions retard social development, when the truth is the opposite. More broadly, it contributes to a perception that progress can and should be driven by commercialization as opposed to solidarity, organizing, and mobilization—the social sphere’s historically effective approaches for addressing the negative externalities of free enterprise. This is crucial because the real transformation of the economy—with a more progressive vision of social enterprise at its core—rests on democratizing ownership and accountability in order to produce more equal outcomes and build new forms of collective power. Finally, the conservative push in the social enterprise movement encourages self-regulation and deregulation in the economy. Those states that have authorized and validated L3Cs, for example, require little by way of application material, and virtually nothing in terms of annual reporting. For benefit corporations, government requires little or no disclosure of financial transactions. Such corporations turn to purportedly disinterested third-party evaluators to verify their social benefits, but these reviews are conducted largely without government involvement and verification. Because social enterprises are not tax-exempt entities, they are freed from the kinds of regulation that nonprofits have to endure. Conservative supporters seem to believe that operating in the market will make them automatically more accountable than any form of public or democratic oversight. And as Erik Trojian, B-Lab’s director of policy noted at a recent Georgetown Law School conference, “If we start to overregulate this form, we’re going to see no one going into [the creation of benefit corporations]” in the first place. Like any good corporate lobbyist, these advocates argue that regulation is important and necessary for others, but not for them. Boosting the image of business, suggesting that capitalism can and will solve the problems that its own behavior creates, telling workers that they don’t need labor unions, and calling for limited regulation—these are common elements in the conservative interpretation of what social enterprise means, at least in the U.S. It’s a recipe that reads like the agenda of many business trade associations, except that social enterprises say that they will operate to solve social and environmental problems. “It’s time to invite them in,” says Jean Case, and many states are doing exactly that. On April 1st 2015, Republican state representative Chuck McGrady introduced a new bill in the North Carolina Legislature to authorize socially conscious benefit corporations and override the legislature’s rejection of his own benefit corporation bill two years earlier. "It's a for-profit entity that can do nonprofit work," McGrady said, "I'm just hoping that with another shot that people will have looked at it and realize this is not a huge plot or anything like that. It's simply an effort to provide North Carolina businesses with the same options that other states provide." Perhaps this time around, Rush Limbaugh will see social enterprise as comfortably ensconced in a right wing economic and political agenda.